Use wooden struts attached to your bed base. The headboard will be completely flush to the wall if mounted and look much nicer. Wooden struts have a habit of clattering against the wall behind and leave a small gap. This picture shows where the screws need to be placed in the wall to allow the ‘Hangers’ to hang on. The headboard should gently rest on the surface of the mattress when hung and there should not be a gap. On the back of the headboard, measure and note the distance between the centre of the ‘Hanger’ and call this, (distance 1). Also note the distance from the bottom of the headboard to the centre of one ‘Hanger’ and call this, (distance 2). These measurements must now be transferred to the wall where the headboard is to be hung. 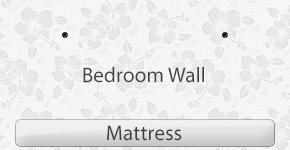 With the bed in the correct place in your room (vital), find the centre of the mattress and measure up (distance 2) and put a small mark. Then half measurement (distance 1) and put another mark to the left and right of the centre mark you made. Use a spirit level. To be sure the outer marks are the correct height, measure up from the mattress (distance 2) and adjust accordingly. You now have the correct location where your screws should be placed. If you are going into plasterboard, use metal plasterboard fixings and for stone just use standard brown wall plugs. Screws should be 50mm minimum. If you have a very large headboard, there will be fittings at the bottom of the headboard so you can screw it to the wall to eliminate any movement. This is the rear of the headboard with the wooden struts (90cm long) attached using self tapping screws. 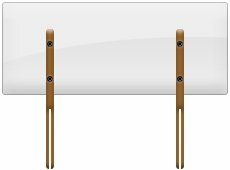 This method is widely used for ease of fitting and will be suitable for all headboards ideally being no more than 61cm – 76cm in height. Most divan bases have fittings in place ready to attach struts. To be sure, please check your bed. Find the securing bolts in your bed base and slide the wooden strut over them and tighten. Make sure the struts are straight and both at the same height. Take your new headboard and sit it on top of your mattress. Move the struts up or down slightly if needed. You can now simply drive the screws straight into the back of the headboard.